NineteenTeen: Nineteen Teen Turns Ten—Let Me Hear You Roar! 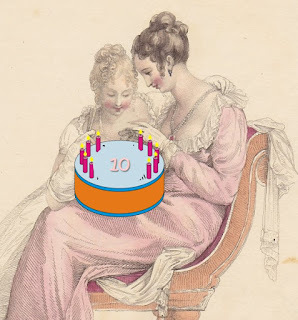 My word—ten years of blogging. Who would have thought? I wasn’t sure how I’d like it. I’d tried journaling and found that the writing pulled me away from my work in progress. Not good for a commercial author. At first the words for blog posts dripped out slowly, somewhat painfully, and at times I struggled to figure out what to cover on a given week. And then I realized—you like research too! Over the last ten years, I’ve learned about pedestrians, hobby horses, the original of matches, and the Grand Tour, research I hadn’t planned to undertake until a blog post beckoned. So thank you, Nineteen Teen readers, for making me smarter on the nineteenth century. Now we stand on the threshold of a new decade of blogging. As we have in the past, we’d love to know where else you’d like us to venture. Please share your thoughts. We’ve done posts in the past because of your encouragement. What are you hungry to learn? The writer of any comment with suggestions, or birthday wishes, or even just a stray “hi” will be entered in a drawing for a $25 Amazon gift card and one of my books (any of my self-published backlist as an e-book or select Love Inspired Historical print books from my stash, including this month’s Mail-Order Marriage Promise). The comment opportunity ends at midnight Thursday, September 28. Winner to be announced in my September 29th blog post. Nineteen Teen—10 years strong. Let me hear you roar! Happy Blogiversary! Love your books! Thank you, my dear! So glad to have you with us! I like the random bits of knowledge that I would never find otherwise.